It has been a couple of weeks since I reviewed new Ancestry hints on my main tree. I have been preoccupied instead working on known already-analyzed records related to the presentations I am giving at the upcoming Texas State Genealogical Society’s Family History Conference at the end of this month. But one of the ancestors I am profiling in those conference sessions is my Mexican immigrant great-grandmother. So when reviewing records for her last week that I have saved to my Ancestry tree this week, I saw a shaky leaf hint for her. I assumed it was–like pretty much all of the others in the past–a hint for yet another public Ancestry Member Tree…which I ignore, since they all seem to copy and publish the same wrong information. The shaky leaf hint was for a U.S. naturalization record. The digitized Petition for Naturalization record that I found last week on Ancestry. It was scanned in the containing folder at NARA Riverside. 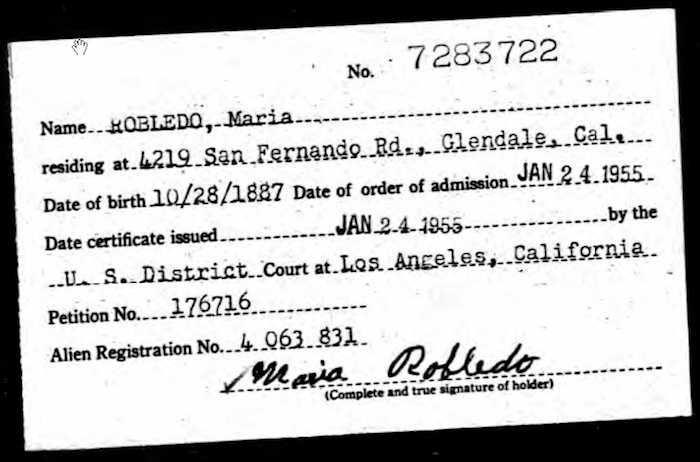 I clicked thorough to view the hint and was pleasantly surprised to come across a digitized copy of my great-grandmother’s 1954 Petition for Naturalization.2 I calmly attached the hint to the entry for my great-grandmother in my Ancestry tree. Calmly? Um…hello! That’s a naturalization record!!! Yes. But, I’d already found that same naturalization record. Twice before. At the U.S. National Archives and Records Administration (NARA). The first time I visited a NARA facility was in 2003, when I worked at the Mission Viejo Library and down the street from what was then the Pacific Region facility of NARA in Laguna Niguel, Orange County, California. On my first of many visits there, archivist Randy Thompson helped me find my great-grandmother’s naturalization documents, pulling the originals–which they hold, since my great-grandmother as naturalized in Los Angeles, California–and allowing me to hold the very document that my great-grandmother signed in 1954. That was back in the days when cameras of any type were not permitted in the NARA Pacific Region research room. So all I could do was make a photocopy of this valuable document. A photocopy which I lost during one of my many moves between 2003 and 2009, when I got married. Although I had extracted all of the information from that record and did have that saved. 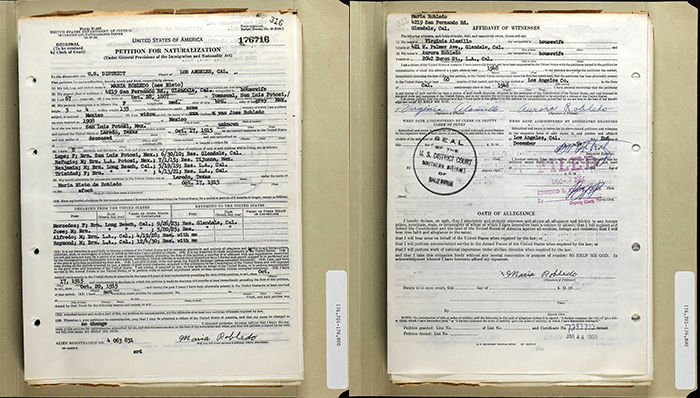 I routinely searched and browsed through Ancestry’s growing U.S. naturalization records collections, hoping to come across a copy of my great-grandmother’s documents. I have over the last few years found many such records for known collateral relatives, but never for my great-grandmother or her oldest daughter who also naturalized. The scan I made with my iPhone at NARA Riverside (note the required NARA attribution top left) with my iPhone in April of this year. So while this week’s Ancestry discovery was not a new record or new genealogical information, it did confirm for me that Ancestry is getting the rest of those digitized Los Angeles County naturalization records online. I don’t find any reference to these records being updated this year on Ancestry’s list of Recently Added and Updated Collections. But I have regularly searched Ancestry’s collections for this very record, and it never came up as a search result before. 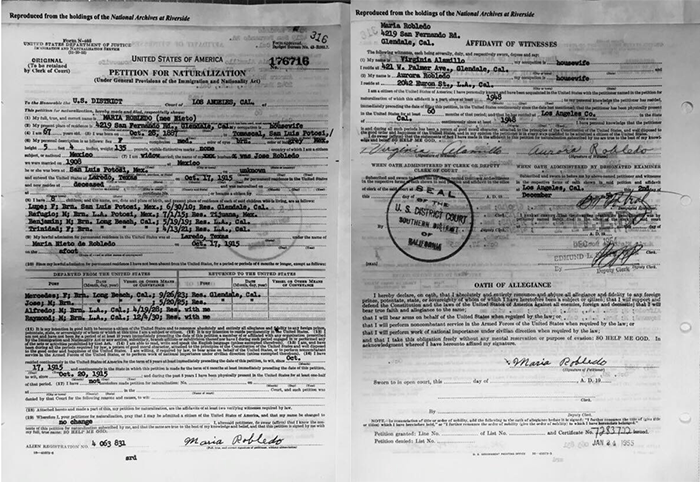 I still do not find the naturalization record for my great-grandmother’s oldest daughter, who naturalized fourteen years later, in the same county and court, and whose original records I have from NARA. So this provides additional affirmation that Ancestry does not yet have all of those Los Angeles County records online yet. Check, re-check, and routinely continue to check Ancestry for naturalization records pertaining to your immigrant ancestors and relatives.